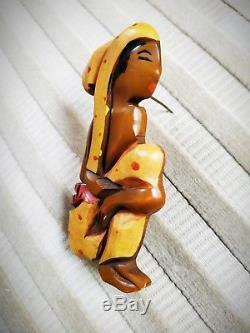 This is a vintage and rare1940s tested bakelite Figural Mexican Ethnic Doll brooch/pin. The colors are yellow, brown, black and red. 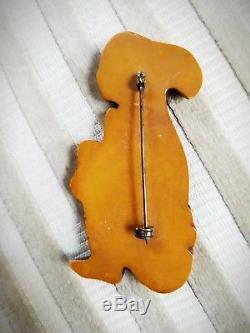 The brooch/pin measures 2 3/4" (7 cm) long by 1 3/8" (3 cm) wide. All my jewelry is vintage or antique unless stated otherwise and has been previously worn. I will note damage, condition issues where needed, but if you need clarification, please ask. The item "1940s Vintage BAKELITE Figural Mexican Ethnic Doll Woman Brooch Pin" is in sale since Sunday, November 25, 2018. This item is in the category "Jewelry & Watches\Vintage & Antique Jewelry\Costume\Designer, Signed\Pins, Brooches". The seller is "zenaid2004" and is located in Roma.